This toddler stage of life is so very precious. They are constantly discovering new things and learning to become independent. This stage can be so much fun but it can also be challenging to keep a toddler entertained. If you’re like me, being couped up in the house all day will likely drive you insane. Don’t get me wrong, sometimes I welcome days like this after a busy week, but I often find myself looking for an excuse to get out of the house, even if it’s just for lunch. 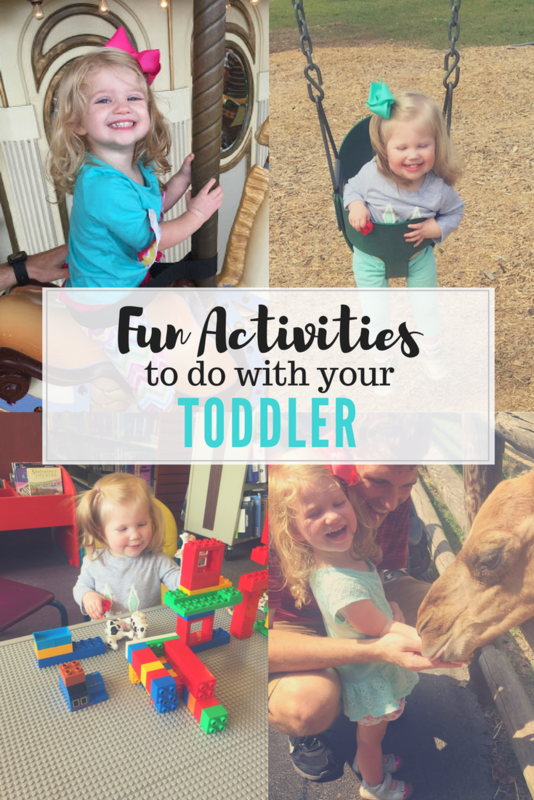 I’ve compiled a list of fun things you can do to get out of your house with your toddler (and a few things to do at home to switch it up a little bit!) Whether you’re wanting something fun to do for a few hours, or a short weekend getaway, this list has you covered! The park is one of our favorite things to do just about all year round, especially during the spring and fall, when the weather is just right! One of our favorites in Madison is Palmer Park. I actually took Audrey there today after her doctor’s appointment and she had a blast! Many malls, whether indoor or out, have lots of fun activities for kids including little play areas, ride on toys, trains, fountains to throw coins in, or a carousel. I’m sure you could also find some yummy treats to share, like ice cream or a Great American Cookie! Christmas so we can ride as much as we want! Raley loves throwing coins into fountains. You don’t have to go to a big pool to swim. Buy a little pool, water table, or sprinkler for your backyard, and your little one will have a blast! During the winter you can take them to an indoor pool to change things up a bit. We love the pool at our local YMCA. They both love this water table! Raley at my parents’ neighborhood pool. She (and I) like the kiddie pool the best because she can touch. We love to go to Chic-fil-a to eat and then let the girls run off a little energy in the play area. This area is better suited for Raley’s age (3) than Audrey’s, but Audrey is usually content to sit and play at the table with me. This is a great place to meet friends and sit and chat while our kids run around. They look thrilled to stop and pose for a picture! I love taking the girls to get a treat to top off the end of a fun outing – it’s just as much a treat for myself as it is for them! Our favorites are Maggie Moo’s ice cream and snow cones from Tropical Sno. She was not even 2 at this time and was fascinated by these little ducks! David’s parents gifted us with a membership to the Huntsville Botanical Garden this past Christmas and we LOVE it, especially the children’s garden. There are so many fun things to do there. We like packing a picnic and just letting the kids play. Even Audrey loves it! Just toddling all over the place! This sand can get a bit messy, but they have a blast playing in it! There are a ton of fun things to do for kids at carnivals like ride kiddie rides, play games, and eat yummy food. There is a kiddie carnival that comes to Athens, AL each summer and we visited it last year and had a lot of fun! I hope to take them to one of the big fairs this year. If you have small children, try to get there early before it gets too crowded. One of our favorite things to do each fall is visit one of our local farms to pick a pumpkin. They have a TON of fun things set up like a playground, corn pits, a petting zoo, hay rides and more. The corn pit is always their favorite. They never want to leave! These events usually have bouncy houses, food trucks, arts and crafts, and sometimes even petting zoos. We try to go to the Madison Street Festival each year in the fall, which is always a lot of fun! One of my very favorite things in the world are my “Mommy and Raley/Audrey days.” I love taking them each out individually, just the two of us, every now and then. Raley’s favorite thing right now is to have a tea party. Last week we took a tea party picnic to the Botanical Garden with us. You can have a tea party or a picnic just about anywhere you want to! You can go to a tea room, have one at home, go to a garden or a park, or even grab a blanket, pack a basket and take it to your backyard! Our “secret garden tea party” at the botanical garden. There is a cute, quiet little area at the back of the childrens’ garden that reminded me of a secret garden. Perfect place for a quite tea party. We had planned on going to Emma’s Tea Room last year before it closed but when we got there we weren’t able to get in because they were booked. Raley was so disappointed! So while she was napping I set up a little tea party to surprise her. She loved it and wanted her little sister and princess dolls to join too. Another thing we did recently on a “Mommy and Raley Day” was go get a pedicure. She loves for me to paint her toes but at home doesn’t like to sit still long enough to let it dry. I thought maybe if I took her to get her nails painted she’d like the water and sit still…and she did! She was on cloud 9! Most public libraries do some sort of story time for young children that sometimes includes a craft. At the Madison Public Library there are little play areas where you can play and read books. It makes for nice quiet play time, which can be a welcomed change of pace. Kids love to help out, even from a young age, so letting them help you cook or bake can feel very rewarding to them. Raley loves to help pour the ingredients into the bowl to make cookies or help pat out the dough and put toppings on a pizza. Last week we let her help make a pizza and she felt so proud when it was done and we told her how yummy it was! Let them help you plant a few flowers in your flower bed or even a pot of flowers. Or, if you’re like me and kill everything you touch, build a fairy garden. Last year Raley and I planted a few flowers in a pot but I am terrible with flowers so they didn’t last very long. This year we’re planning on making a little fairy garden. We love getting the big blankets out, making a fort, popping some popcorn and watching a movie. Although we watch movies just about every day, this mixes it up and makes it feel like something special. If you know us, you know how much we love baseball. Baseball games are always fun to take the family to. The parks usually have activities for kids to do. We terribly miss the Huntsville Stars and wish we lived closer to a major or minor league baseball team. If we did we would definitely take them more. We’re hoping to visit my brother and his family again this year in Atlanta and go to the new Braves stadium. Read about our ballpark trips to St. Louis/Kansas City and Boston/NYC. Our FAVORITE and I wish so badly that Huntsville had a big zoo! If we had one this would be something we would do on a regular basis. But we do try and take day trips to either Birmingham or Nashville every now and then. This is at the St. Louis zoo when we traveled there on our first baseball trip. This is hands down, without a doubt my favorite zoo I have ever been to! They have the best animals. Raley’s favorite was the polar bear. Audrey at almost 5 months at the Nashville zoo. Itty babies can enjoy the animals too! Birmingham zoo feeding the flamingos. You can also feed giraffes at certain times. The Nashville zoo has an epic play area and you can pet some animals! What would you add to this list? What are some of your favorite things to do with your little ones? If we have time before Carson's eye appointments we love going to the McWane Center. It is a must do in Birmingham!